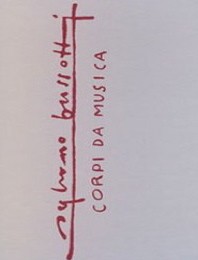 The catalogue of the exhibition Corpi da musica Vita e teatro di Sylvano Bussotti (Bodies of music. Life and theatre by Sylvano Bussotti), curated by Luca Scarlini and hosted at the Museo Marino Marini from February 17 to March 22, 2010, is published by Artout-Maschietto Editore and presents organically and completely for the first time, the figure of the Florentine composer Sylvano Bussotti, with the participation of the musician himself. There are 120 graphic works by Bussotti, including scores, sketches of sets and costumes, portraits, paintings, and theatre programmes. Published in the appendix are the theatrography, the music catalogue, a discography and bibliography of Bussotti. Among the new materials is a selection of discourses on the arts published over the years with a number of different publications, from the neo-avant-garde Marcatre to Frigidaire, in which Bussotti published a series of notes on the cartoon character Ranx Xerox.